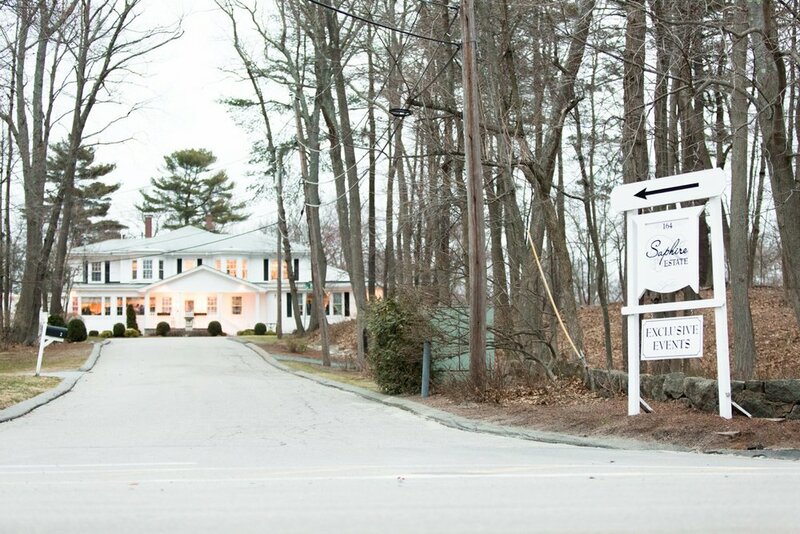 Spring at Saphire Estate is such a beautiful time! 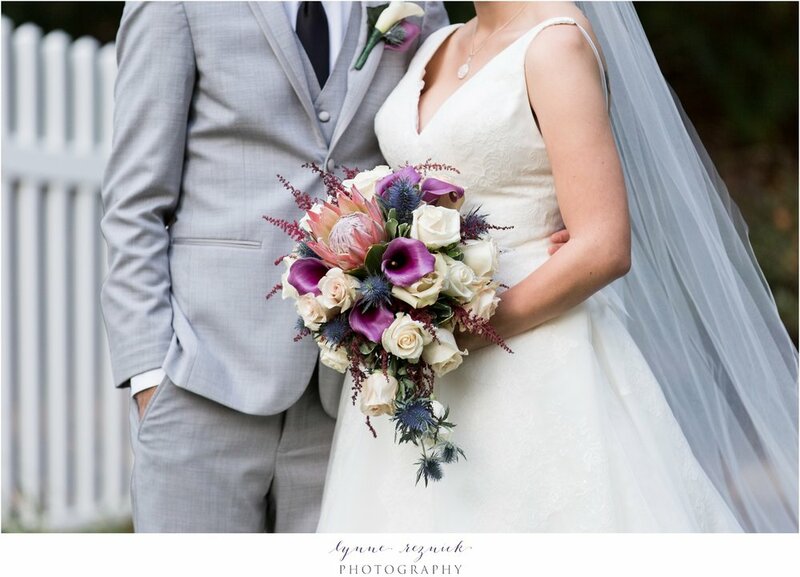 Lilah & Kyle incorporated a spring feel with lots of soft pastel colors in their wedding day color palette. These two are so cute together - they laugh often and are goofy and fun and they both wear their emotions on their sleeves. 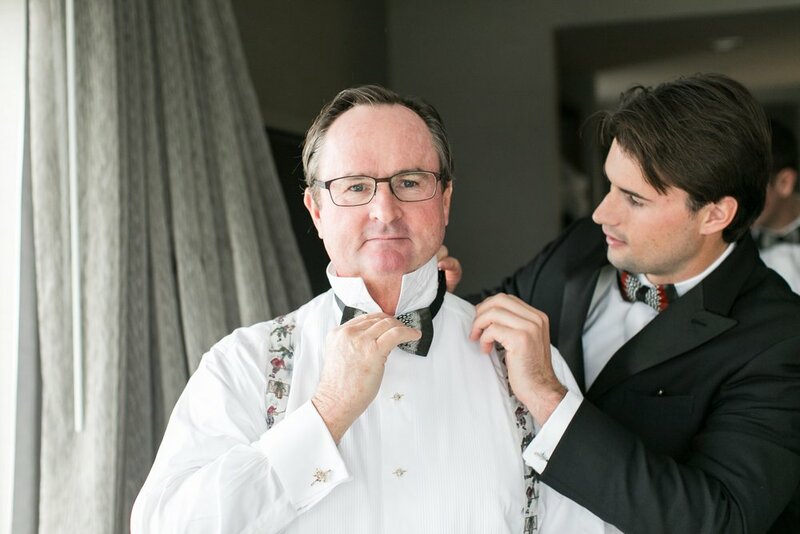 They were most excited about throwing a fun party so they could celebrate their marriage with the people they love. 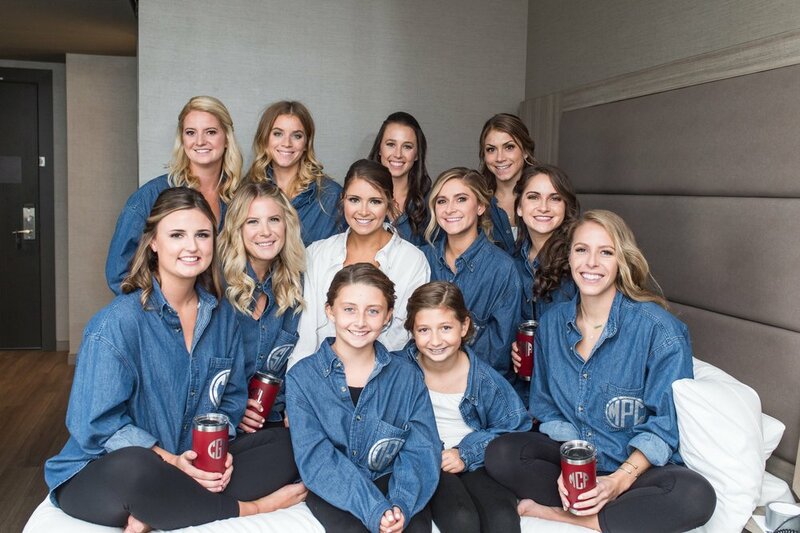 Lilah had some special surprises for her bridesmaids at the hotel. 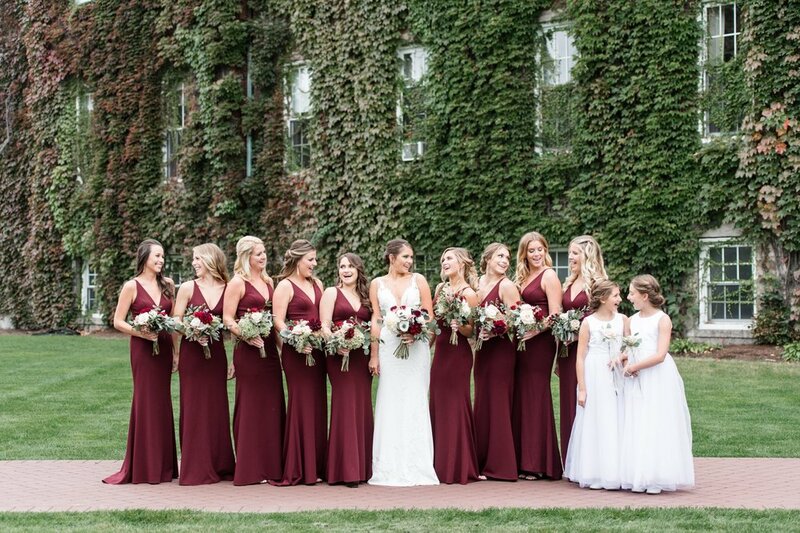 She gifted them all with robes to wear throughout getting ready and planned a special photo where she gave each of the ladies a small chalk board and had them write how they knew Lilah on it. Then they all piled onto the bed for a photo together, holding up their boards. 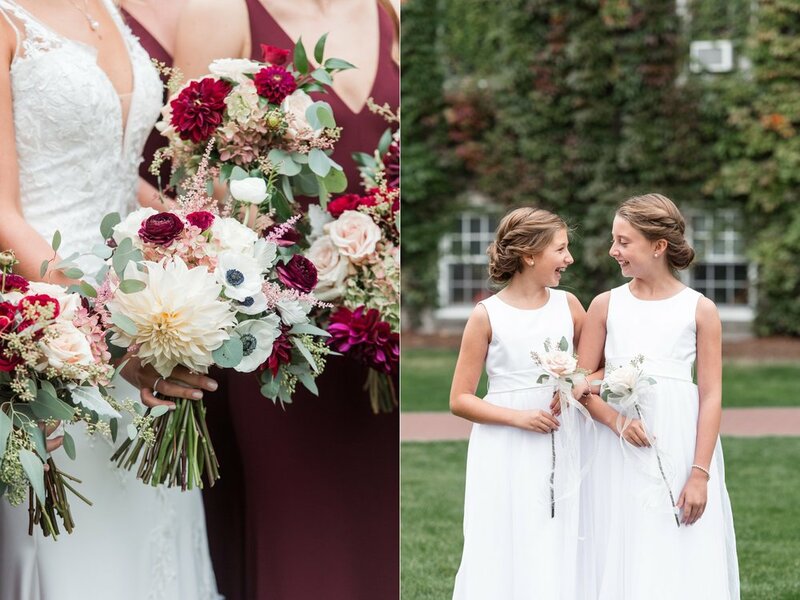 It was a sweet way to see how people from every part of her life, from her sister, to her grade school friends, to her college besties each first connected with Lilah. 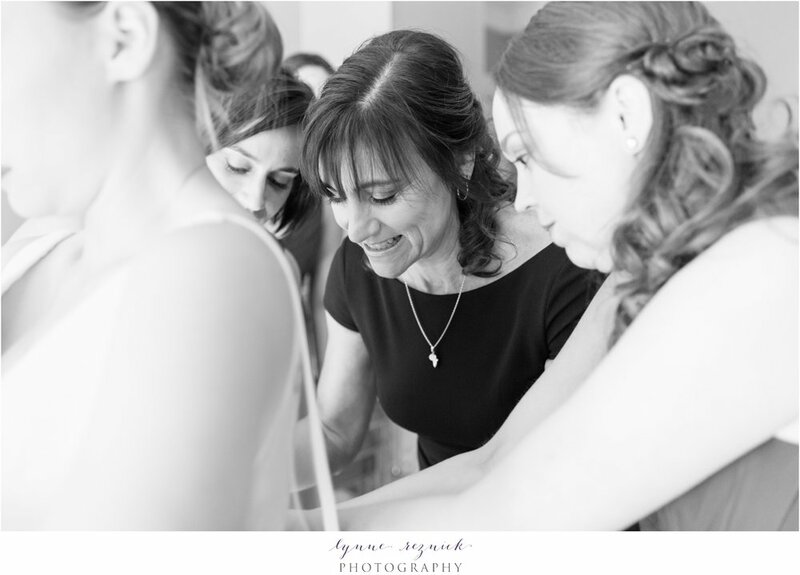 And with hair and makeup done on site the girls felt pampered and looked beautiful. Not to be outdone, Kyle brought his barber to the hotel for all of the guys to get fresh cuts! 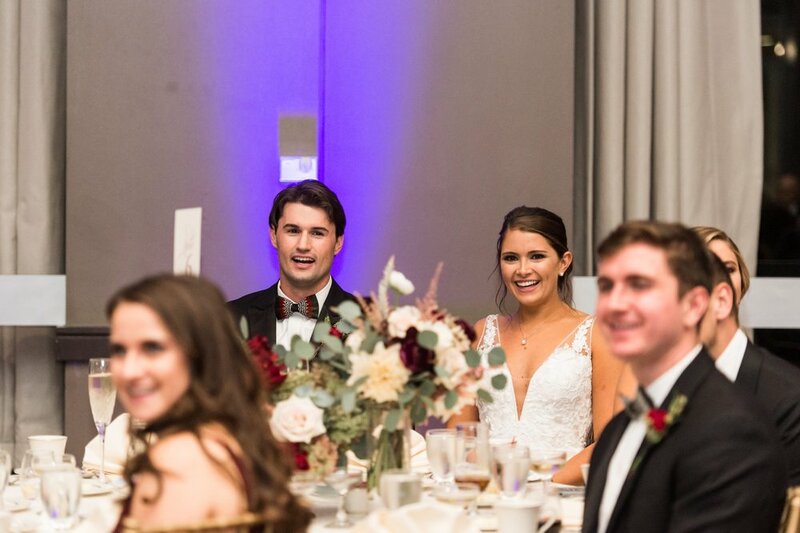 And as a testament to how truly thoughtful and fun these two are, Lilah and Kyle both popped champagne and toasted their friends and family before leaving to tie the knot. 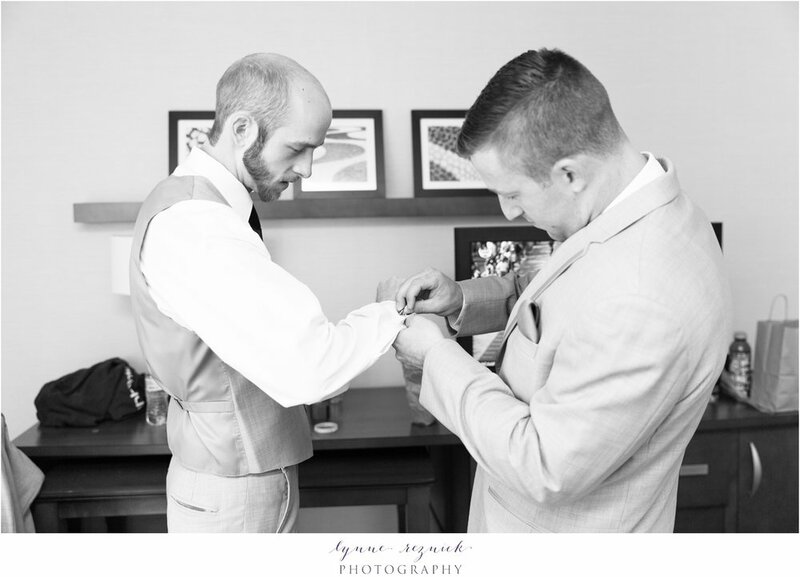 The day was all about their love and that included the love and support they felt from friends and family and they each made a point of celebrating that love and support throughout the day. 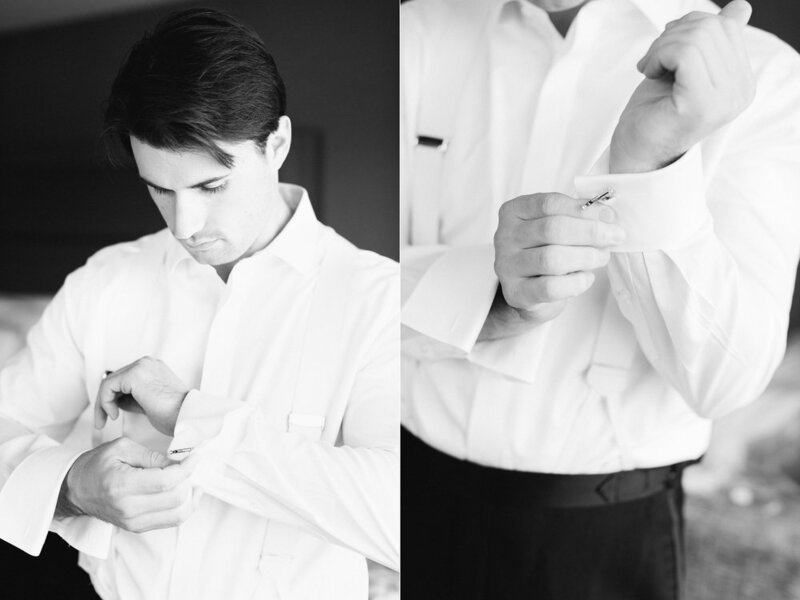 I told you these two both wear their hearts on their sleeves and there isn't a more perfect example of this than their wedding ceremony at Saphire Estate. 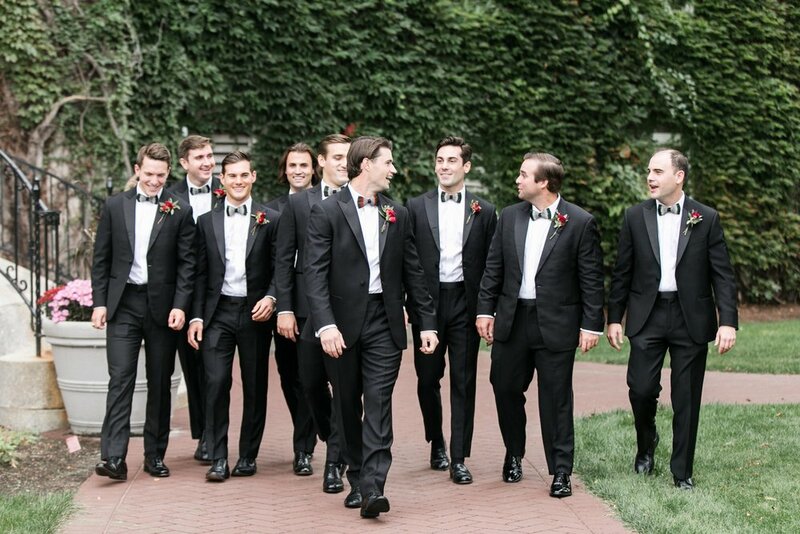 Kyle had the most genuine and emotional reaction I've ever witnessed from a groom as he saw Lilah for the first. 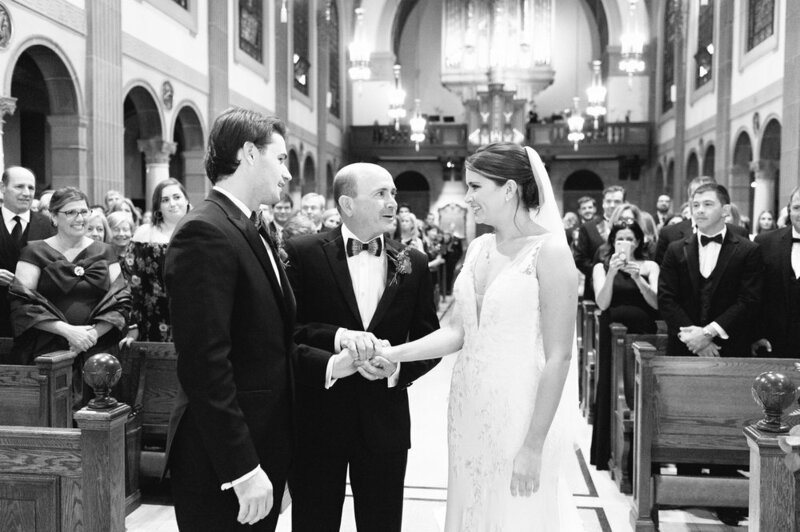 He immediately teared up as she walked arm-in-arm down the aisle with her father. 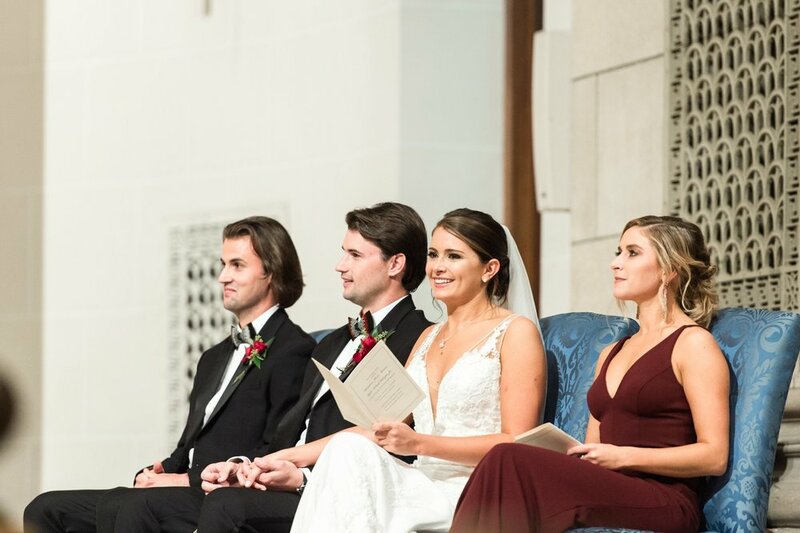 Lilah's cousin was the officiant and he shared warm wishes and words of love and encouragement from both Kyle and Lilah's parents throughout an incredibly heartfelt and personalized ceremony. 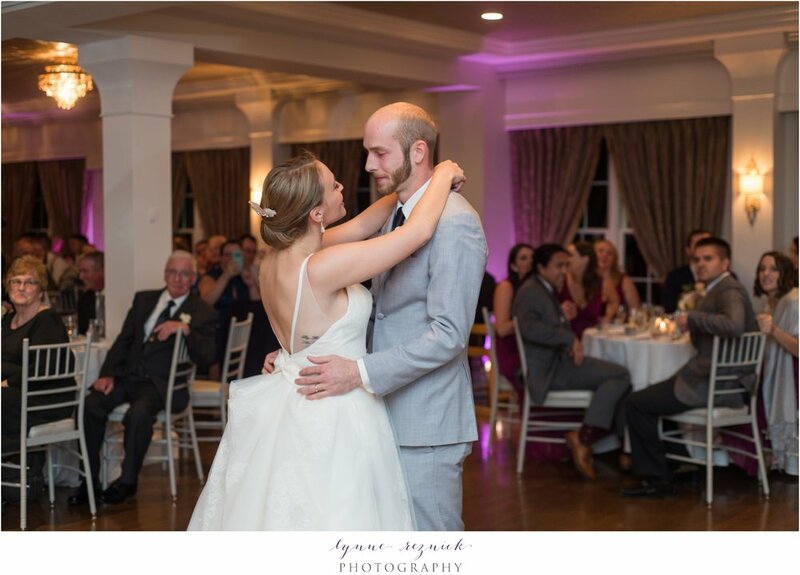 He had both bride and groom, as well as most of the guests welling up with happy tears time and again as he shared about how special Lilah and Kyle are as individuals, how well they fit together as a couple, and how strong their love is. 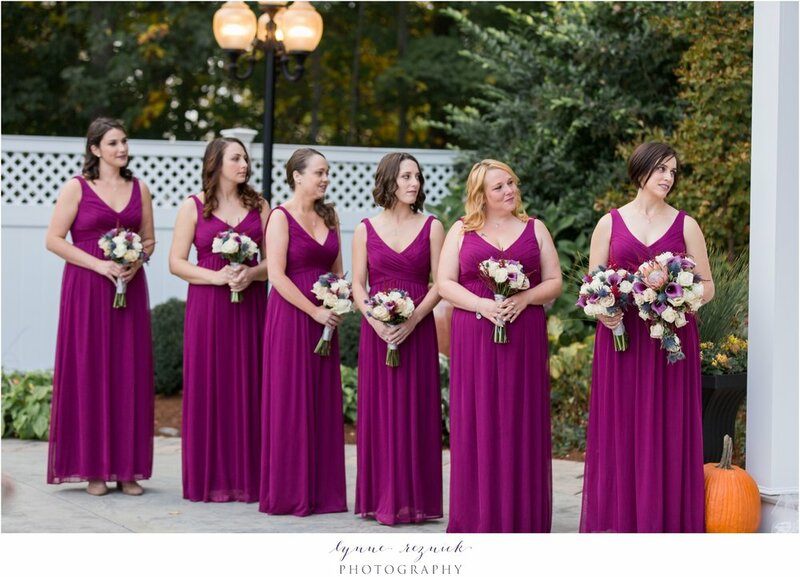 Lilah was so excited to tie in pastels for her spring wedding and the ladies dresses in different pastel colors were exactly what she envisioned. Seeing them together Lilah was so excited and happy - it was wonderful to see her vision come to life and how delighted it made her! Saphire Estate really allows couples to maximize their options in a small and convenient area for portraits. It's situated directly across from a lake and they have a small private section of beach that is perfect for portraits. 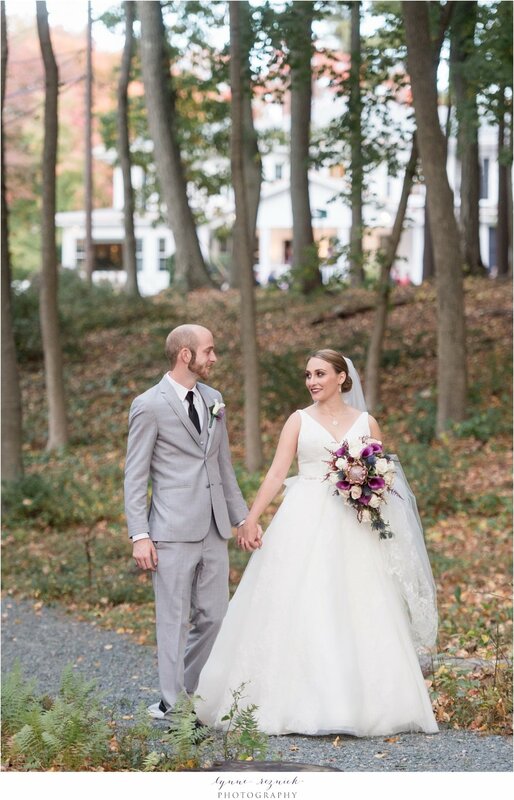 They also have the sweetest path through the property for gorgeous photos in the woods and the building itself, crisp white and stately, makes for a beautiful backdrop. 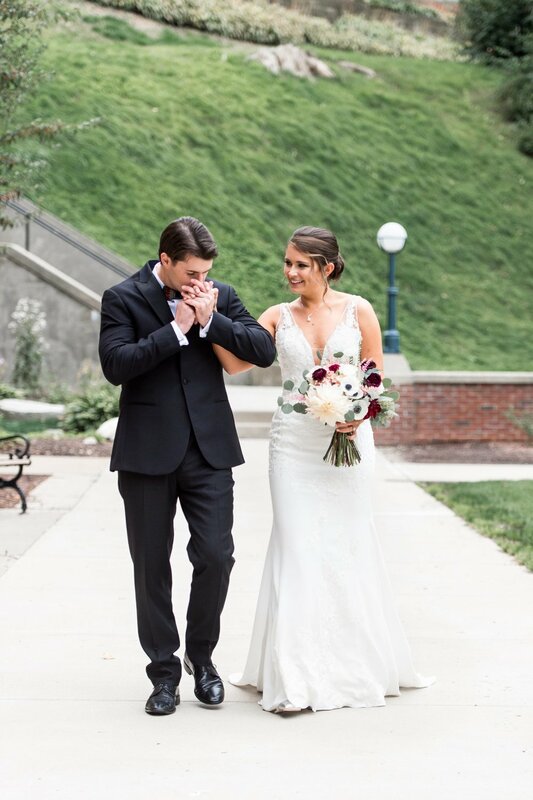 It was a cold spring evening so we warmed up after the ceremony by going inside for family portraits and then Lilah and Kyle braved the cool evening air for their couple's portraits. 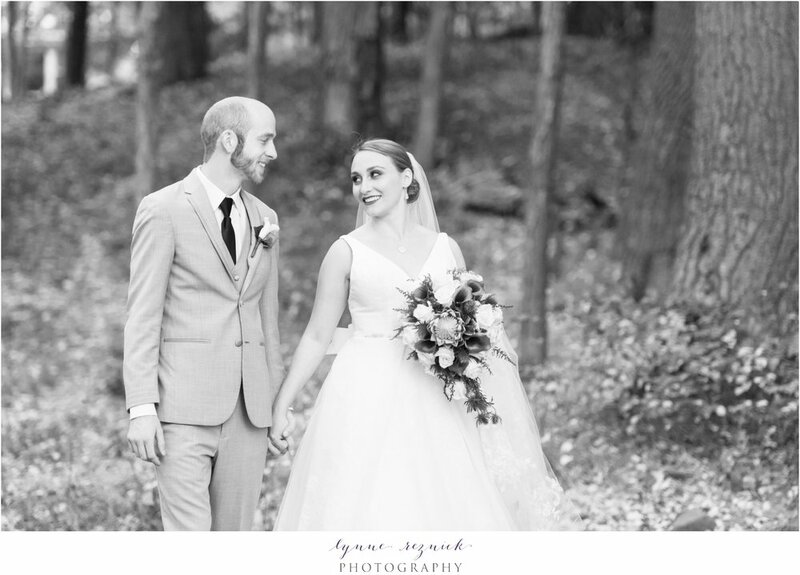 It was the perfect excuse for them to snuggle up close together and we were able to create some beautiful portraits of them in just a few minutes and then get them back into the warmth of their reception! 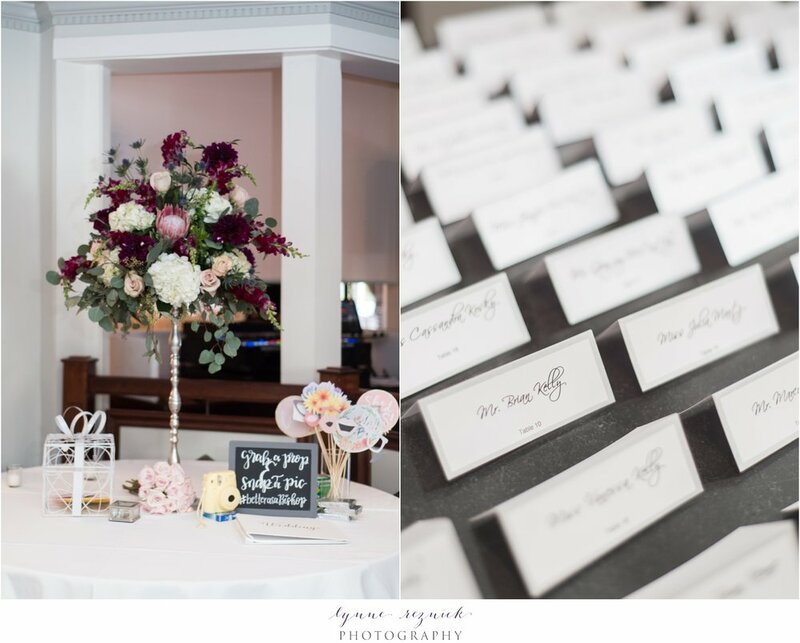 They added some really fun and personal touches to the reception with table numbers created by hand that each featured different childhood photos. They asked their guests to sign a piece of wall art as their guest book. 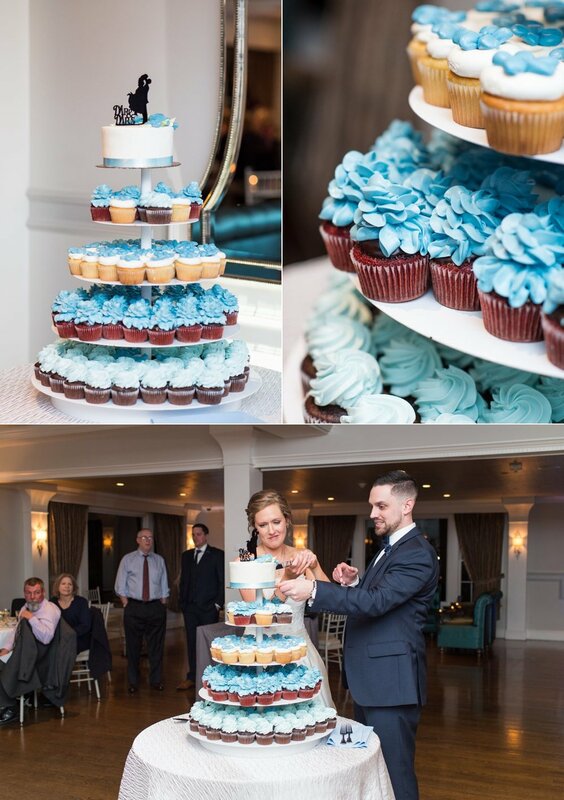 And they opted for cupcakes that matched their wedding colors and came in a variety of flavors instead of one traditional cake. Then the party really began as toasts were given and they had their first dance. 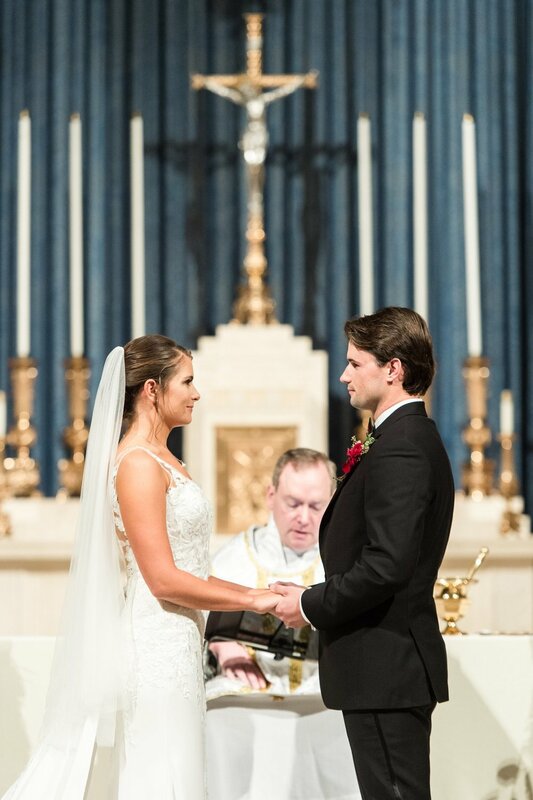 Throughout it all, their love for family and friends shone through. They set a table with photos to honor loved ones who had passed and had a special moment for Lilah's cousin Becca, who she was very close to and who passed away a few years ago. 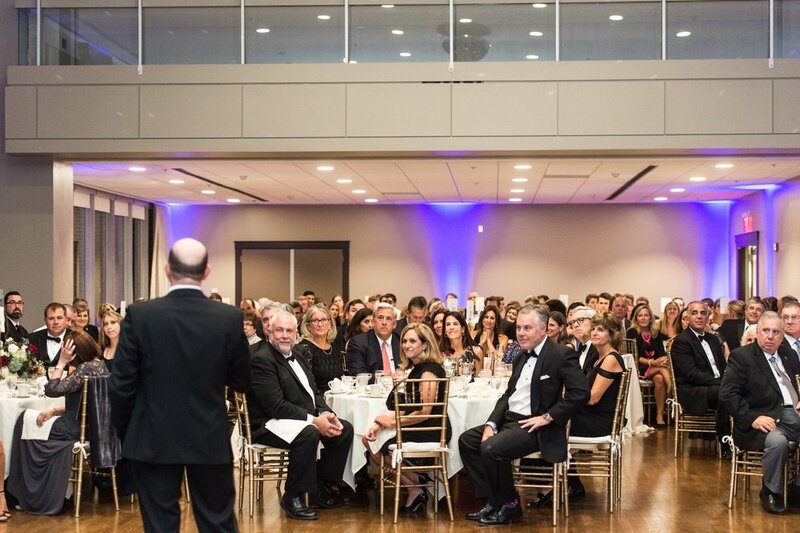 Lilah holds an annual event to celebrate her cousin's life and the family has a scholarship fund set up in Becca's name as well. 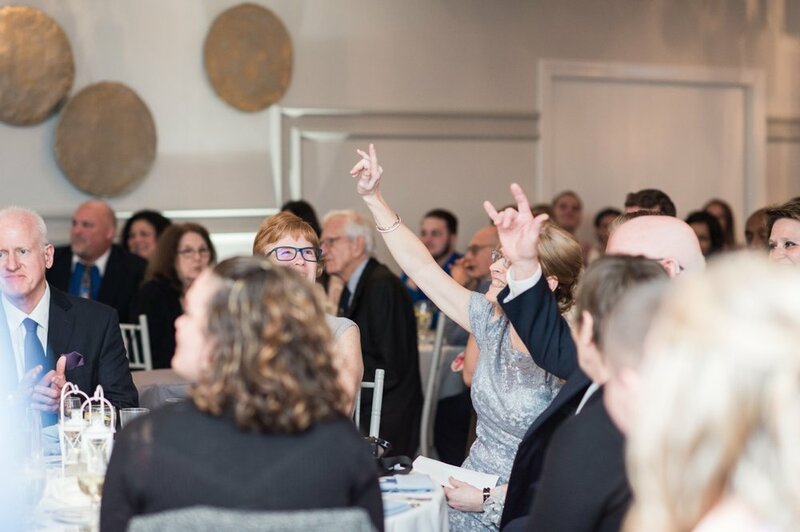 So it was perfectly fitting that Lilah and Kyle remembered her, as Becca was undoubtedly smiling down on them throughout the day. 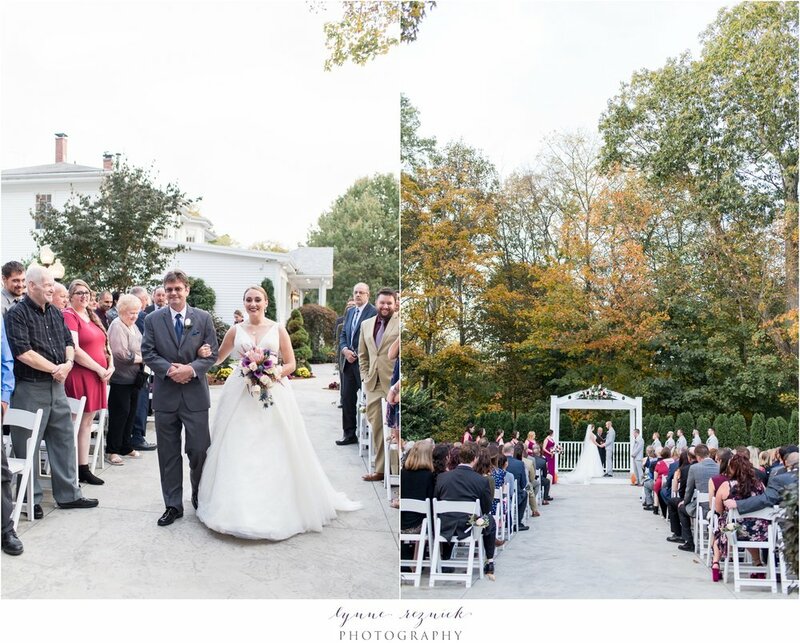 If you loved this Spring wedding and want to see what the place looks like in the fall, check out Cinzia & Johnny's fall wedding at Saphire Estate last year. 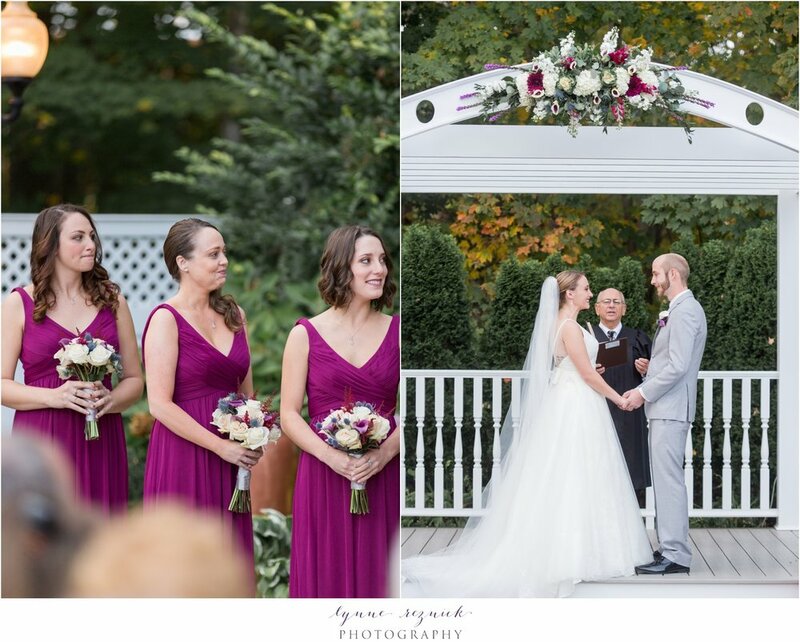 Cinzia and Johnny were married on a warm fall day at the Saphire Estate in Sharon, MA. 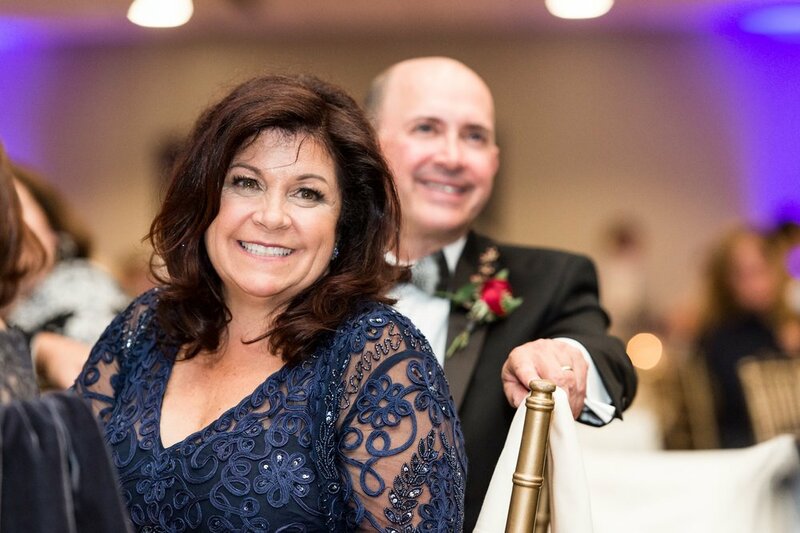 These two are high school sweethearts! 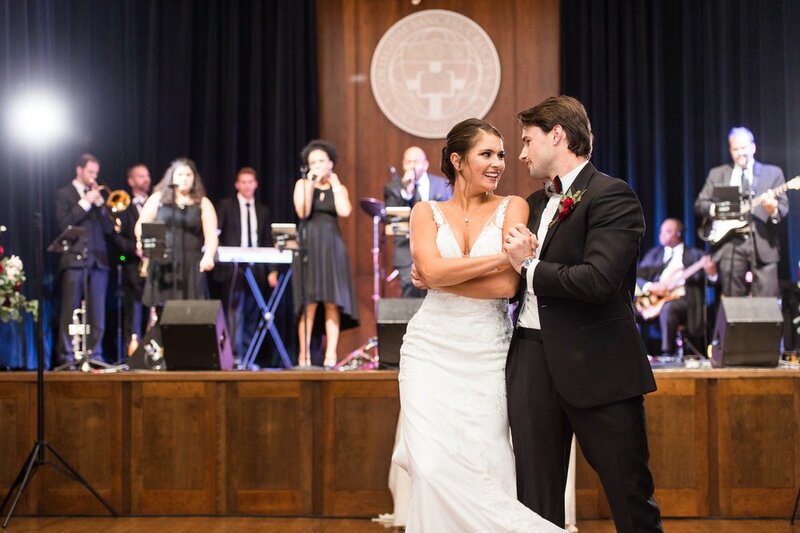 Yes, you read that right - high school sweethearts! They met when Johnny was a freshmen and Cinzia was a sophomore and they started dating a month after they first met. 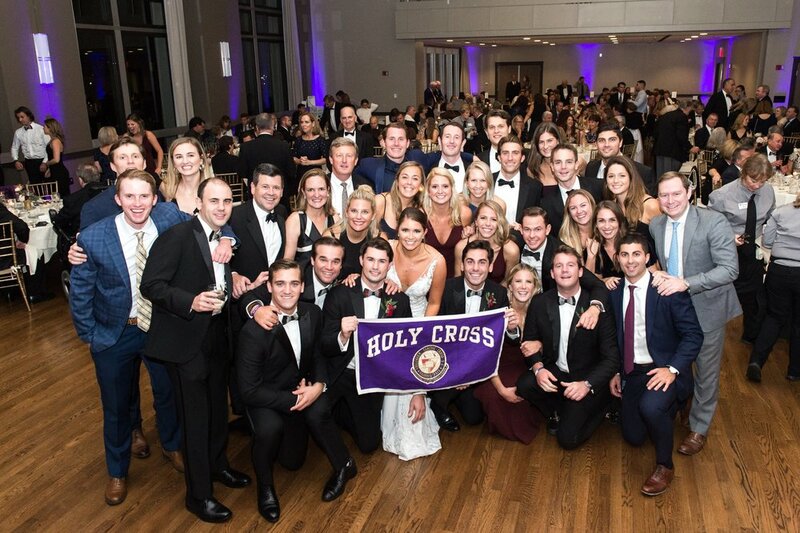 They then went away to separate schools for college, with Cinzia at Bryant and Johnny at SNH, and although long distance for several years was difficult, they never wavered. By their junior and senior years in college they had figured out how to do long distance and knew that they would be together forever. 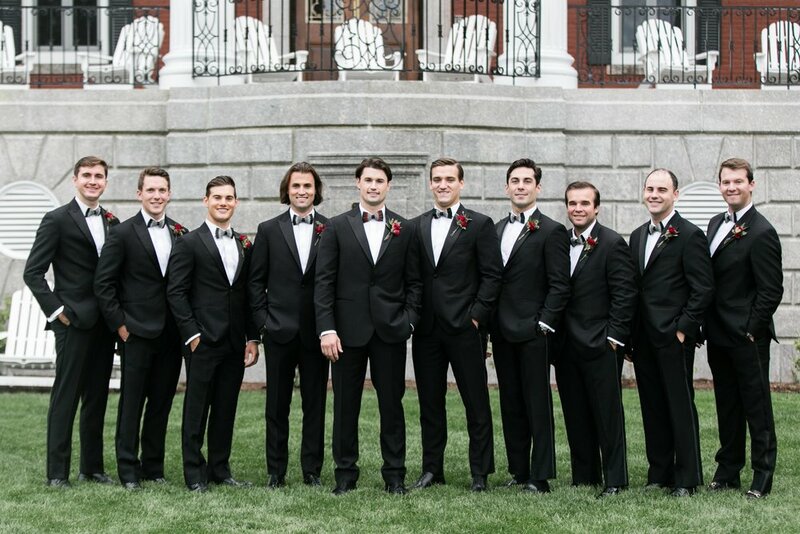 In a truly romantic move, Johnny proposed on Valentine's Day! 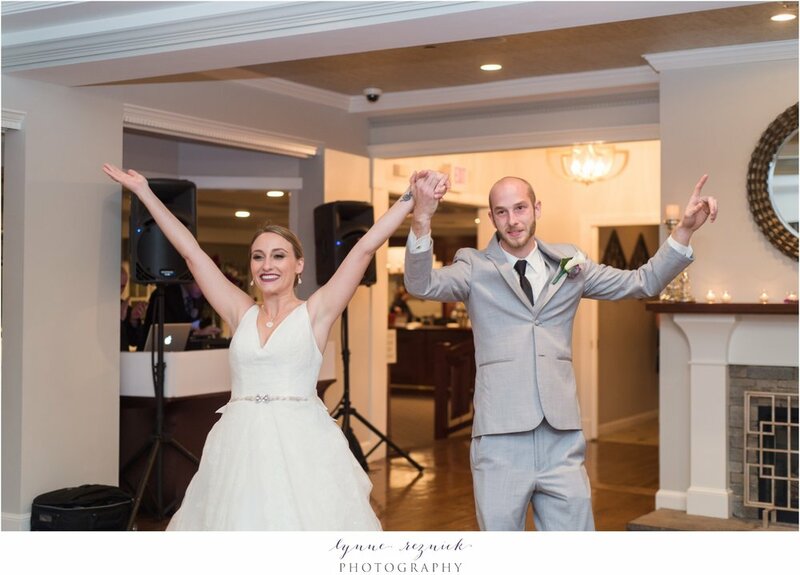 After 9.5 years growing up side-by-side and staying together through high school and college, they were so so happy to be getting their life as a married couple started that the party to celebrate these two saying I do was brimming over with love, joy, and fun! Cinzia and I met at a bridal expo two years ago. 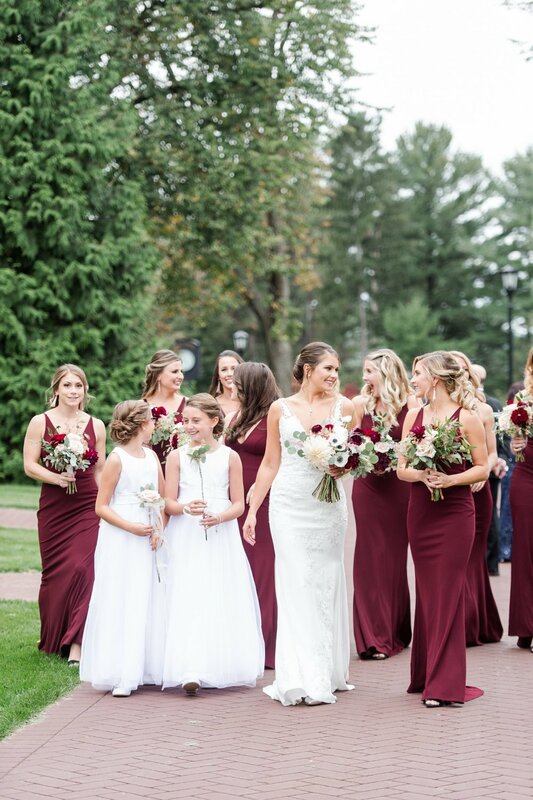 But she wasn't there as a bride, she was there as a rep for David's Bridal! 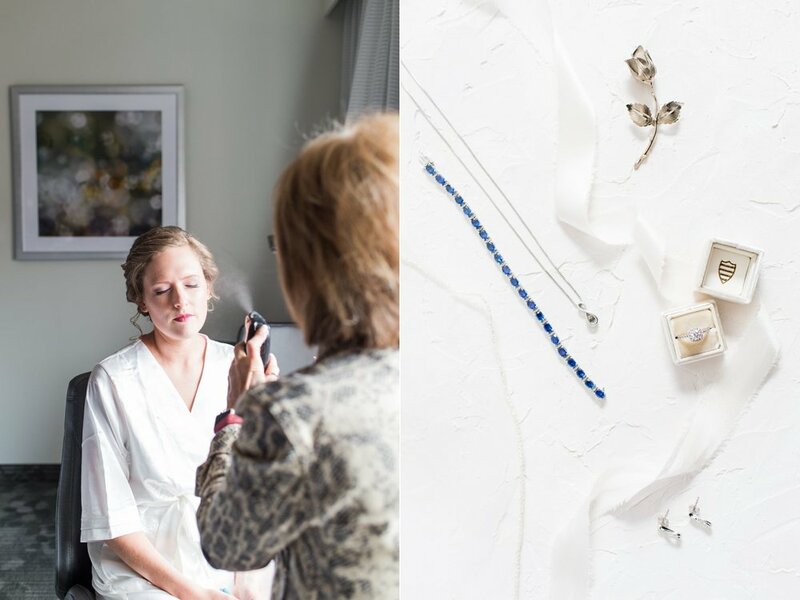 Needless to say, it was really fun to see her over the course of her engagement at a few different bridal shows in the area as we showed up at them together! And her dress is a gorgeous beauty from David's Bridal White by Vera Wang collection. 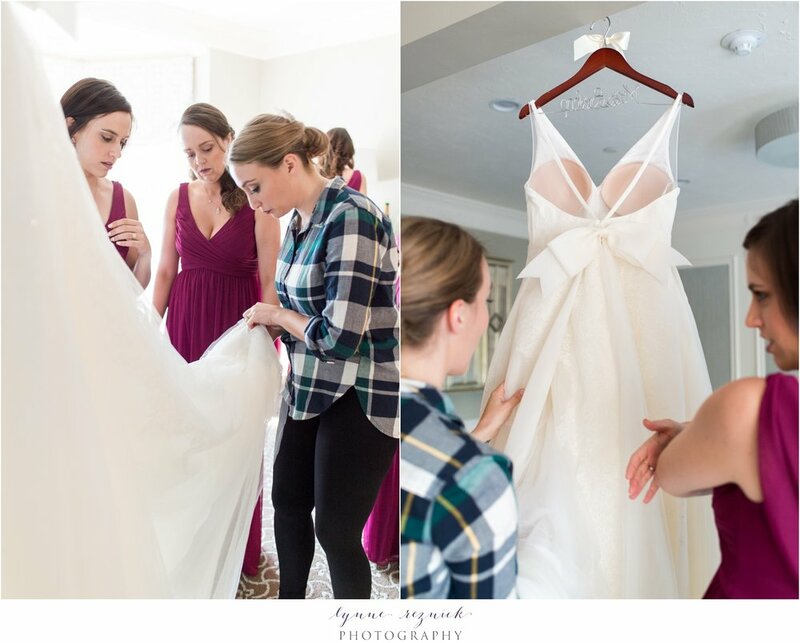 With a stunning low back and a bow that is to die for - obviously, I'm still drooling over her dress! 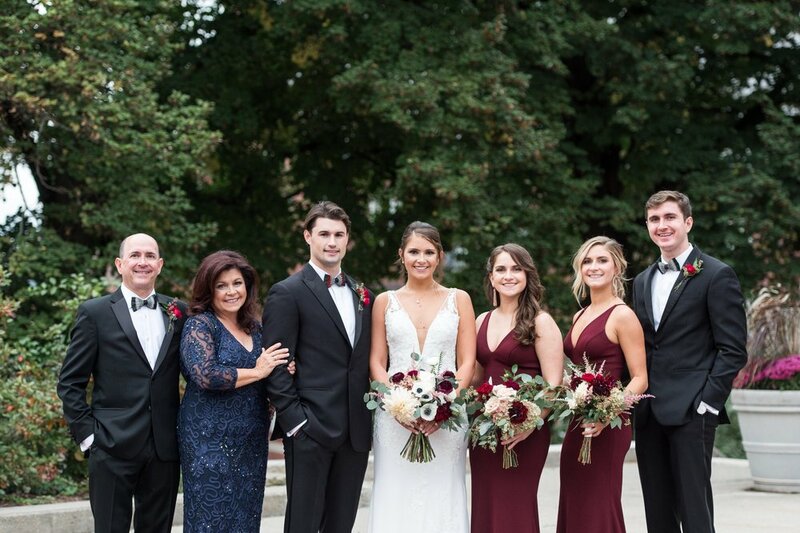 Cinzia and Johnny wanted a warm rich color scheme for their fall wedding so they chose a sangria burgundy as their main accent color and incorporated gray suits for Johnny and the guys to allow the deep colors to pop. 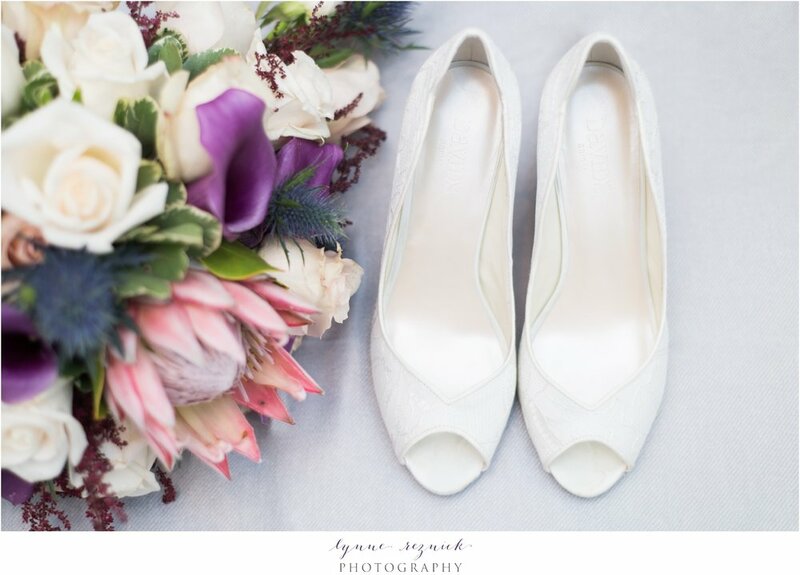 To add depth, they also had rose quartz and blush pink accents in their designs. 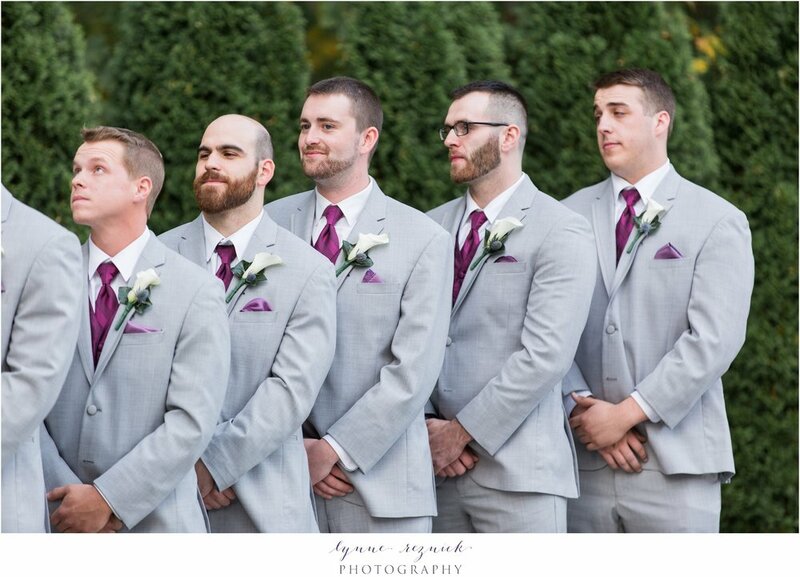 They added deep maroons and purples in the groomsmen's vests and pocket squares, as well as in their stunning florals from Studio One Twenty Three West to tie it all together. 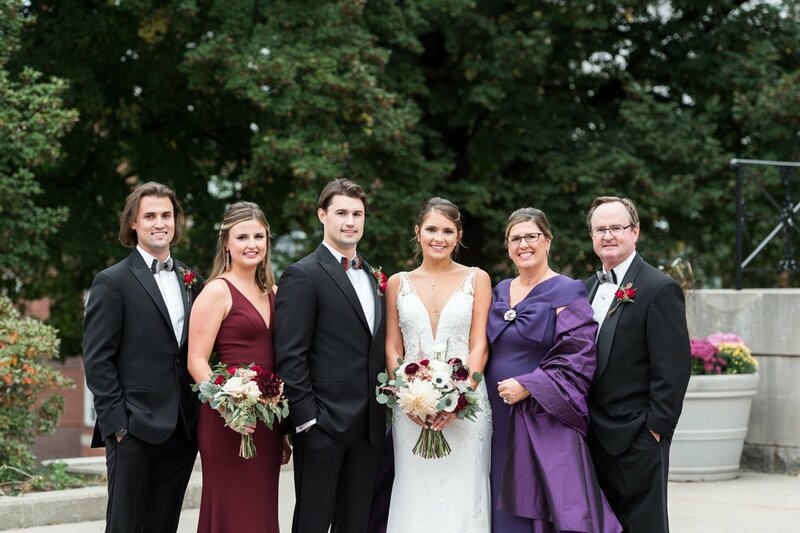 And Cinzia went for a bold dramatic look in her makeup with a deep wine lip color. Sarah of Beautiful By Sarah did a fantastic job bringing Cinzia's vision for a classic bold look in her makeup to life. 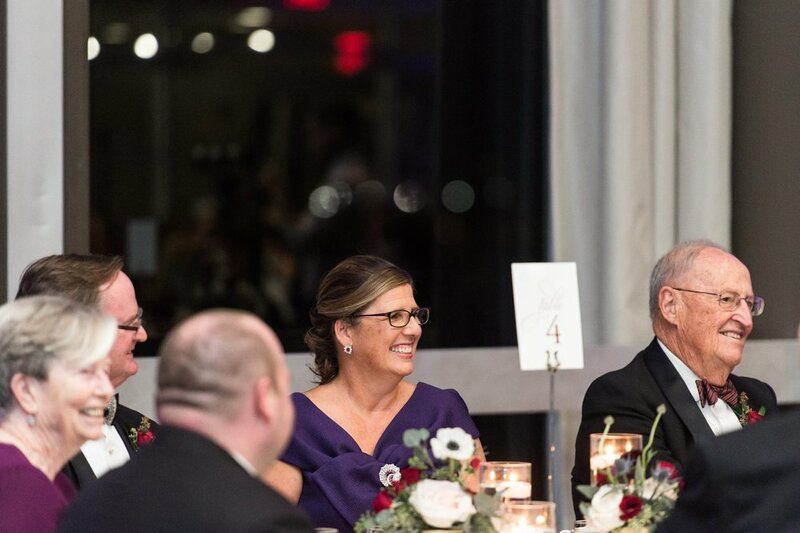 I loved the elegant twist on classic that she chose for her hair as well with a neat updo by Taglio Salon accented by a rose quartz comb from Emma Katzka. 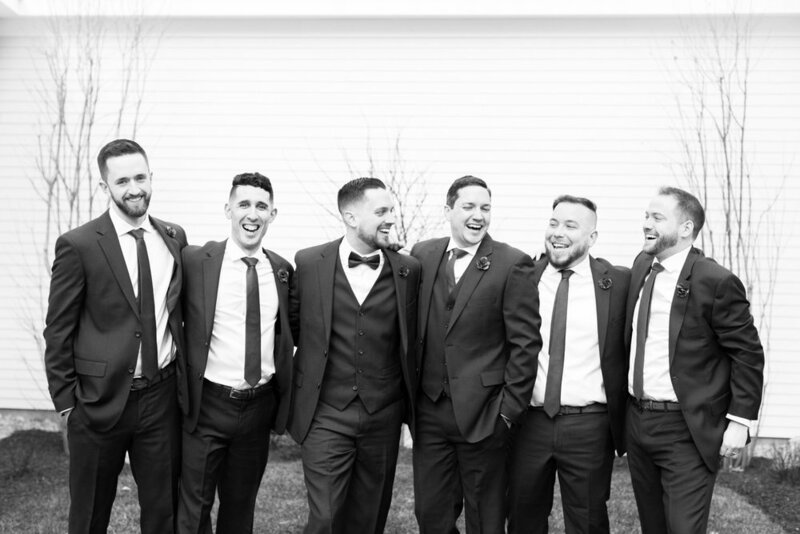 Ceremony: I Do's - 9.5 Years In the Making! Saphire Estate has beautiful grounds and a lovely garden area for the ceremony. 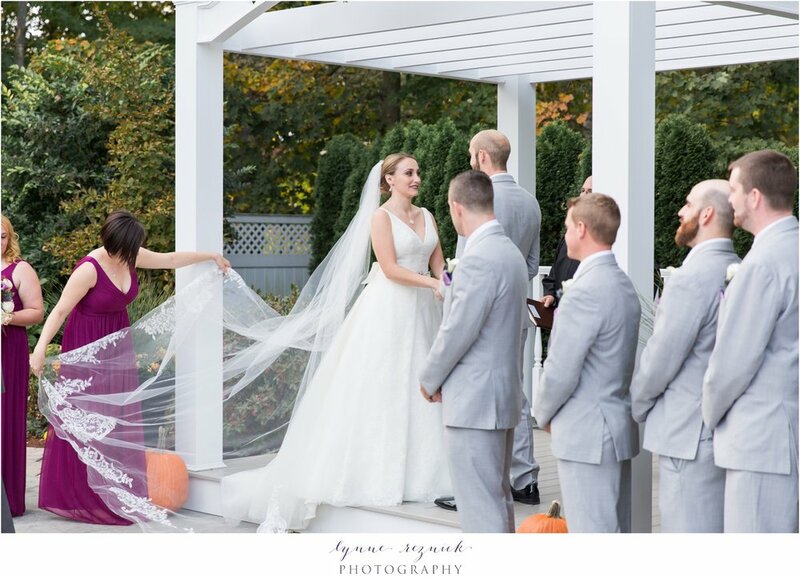 The fall colors on the trees surrounding the ceremony space were the perfect backdrop and exactly what Cinzia and Johnny were hoping for in choosing a fall wedding date. 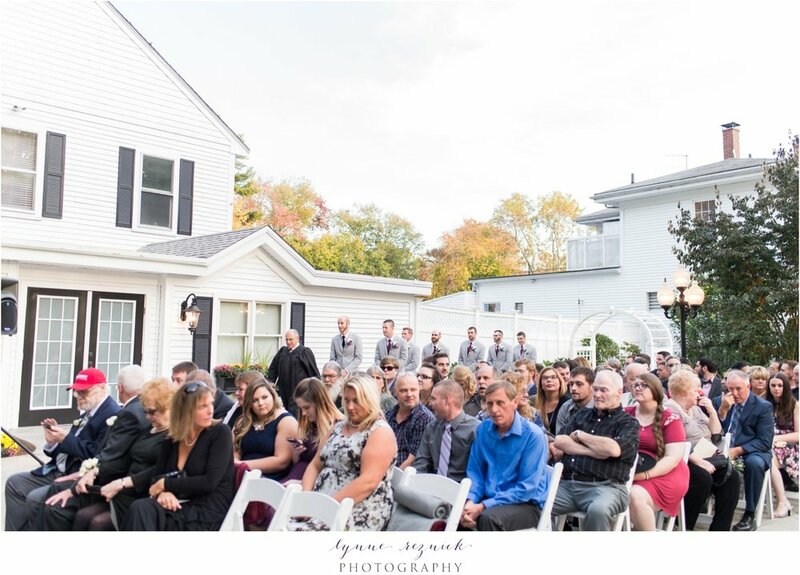 Cinzia's mom did a reading and friends and family looked on and cheered during their first kiss! 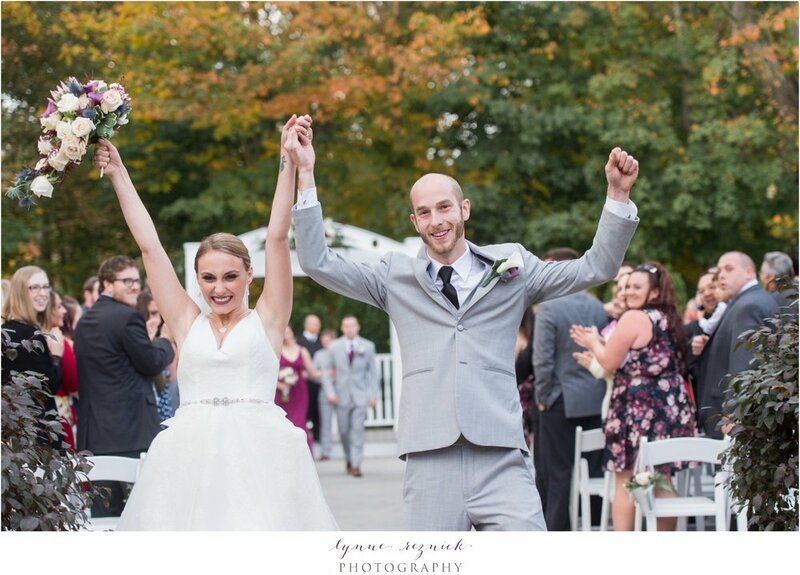 I love the excitement on their faces as they walked back down the aisle as husband and wife! I love the grounds at Saphire Estate. They have a gorgeous trail through the woods that afternoon light pours into through the trees. 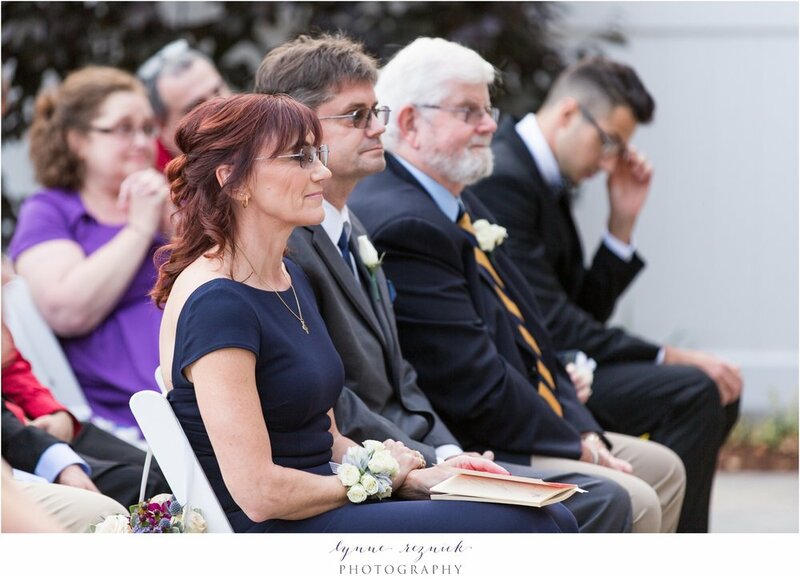 They've placed a stone bench part way down the path and it's a perfect spot for couples to snuggle up together for a quiet slow moment in the midst of the wedding day hustle and bustle. And it made the perfect spot for photos too - bonus! And then just across the street is the estate's private beach overlooking a lake. 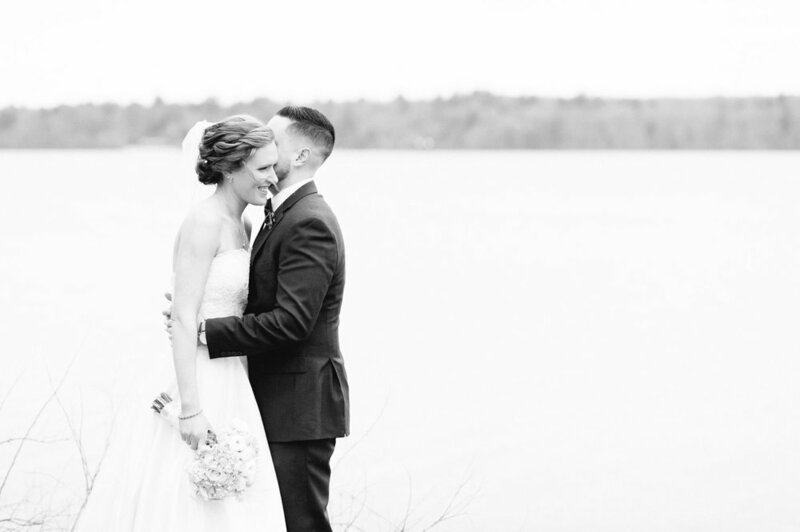 The sun sets across the lake and makes for a romantic and beautiful spot for portraits. 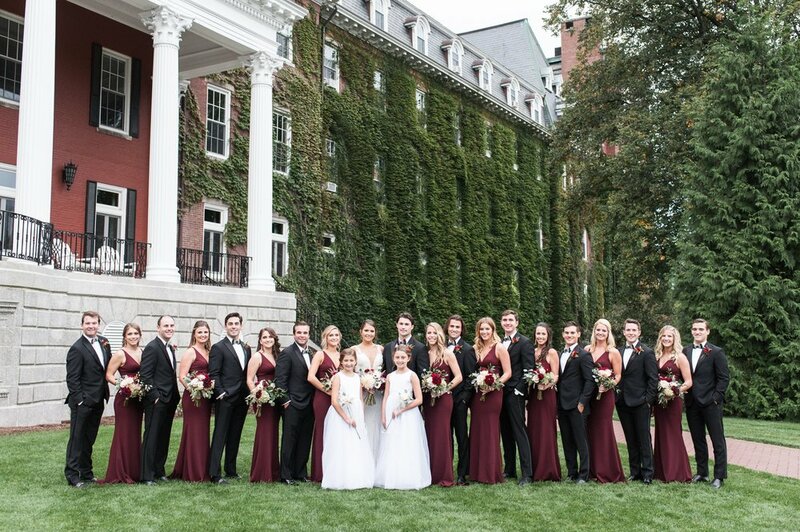 We did both bridal party and couples portraits right on site because there were so many beautiful options.